After a very bad experience with a Forex broker, you may be thinking about moving on to greener pastures. 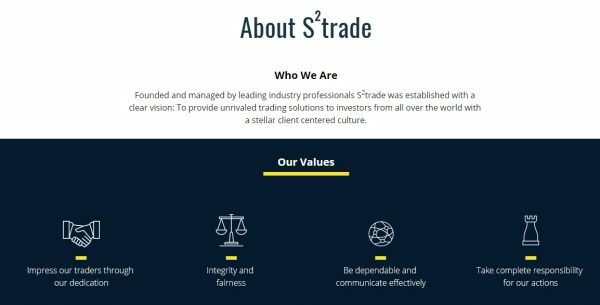 If you have Googled various options and perhaps landed on the S2Trade homepage by coincidence, then maybe it wasn’t your day because that is a broker that should be avoided like the plague. The S2Trade scam has managed to lure in hundreds of traders who have all lost most or all of their capital in the process. 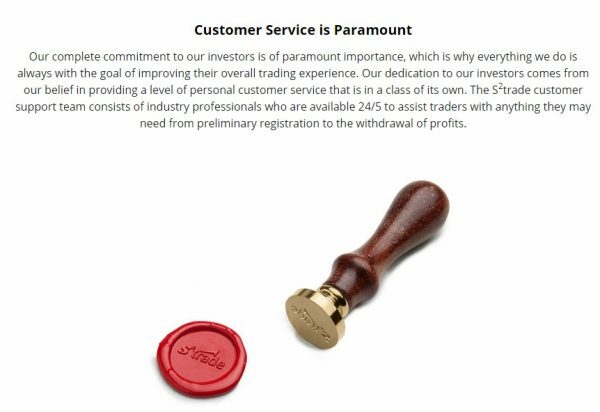 Fortunately for you, this S2Trade website review will highlight the inconsistencies in the company that should have raised alarm. 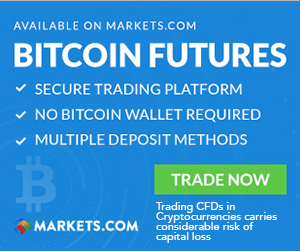 Do not sign up with this broker! What is the background of S2Trade? It is obvious that no one can trade in the Forex markets without the help of a Forex broker. The industry is a trillion dollar industry where most of the main participants are major global banks, corporations and central banks. To participate, you would need a broker to give you access, so it is accurate to say no one can do without a broker. 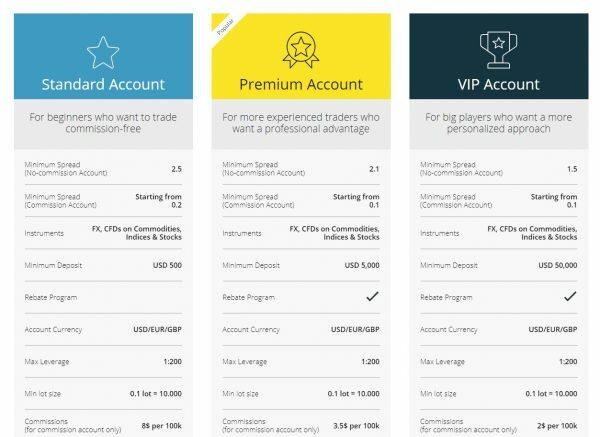 S2Trade is one such broker, but we would not recommend them to anyone based on this S2Trade review that clearly shows they are running a scam. First, the company is not licensed by any financial regulator whatsoever. On their website, they have indicated that S2Trade is the tradename for the company GoldTech Media Services OÜ, which is based in Estonia. There isn’t any mention of a license or financial regulation at all. This in itself is not always a negative thing as there are some good Forex brokers that are not regulated. Nevertheless, it does increase the risk to their clients who do not enjoy any protection from the authorities. Without regulation, a broker can easily disappear into the woodwork leaving no trail but the complaints of their former clients. An S2Trade review of client feedback shows that this is exactly what they have been doing, simply because they have no one to answer to. Second, and the most powerful evidence against working with S2Trade is that its parent company is extremely sketchy. GoldTech Media Services OÜ has another Forex broker under it, this one called Glenmore Investments. This appear to be very fishy since it is unusual for one company to operate two different branches, both providing the same services. Furthermore, there are inconsistencies within the website itself where the contact number provided is one based in the UK. Upon tracking the origin of the number, it turns out that it is actually just a virtual phone number. There is no legitimacy in using virtual phone numbers, especially for a company that expects its clients to make financial deposits. Finally, S2Trade reviews are overwhelmingly negative when you go through the various broker review websites. It is not clear when S2Trade began its operations, but so far, it has garnered a barrage of negative reviews. Among these, the most common complaint is that the company fails to process withdrawal requests. They do this either by delaying the process until a client gives up, or by manipulating the markets so that it seems you are losing money. They are able to do this because they are not regulated by any regulatory body, which is why you should always try to avoid unlicensed brokers whenever you can. Besides delays in withdrawals, the cost of trading is also unusually high. A look at their website show that their spreads range from about 1.6 to 2.4, even on major currency pairs. This is unusually high for a broker and is about double the industry standard. Therefore, those who work with S2Trade are likely to lose more money than their counterparts are. All these factors prove that there is an S2Trade scam going on, and traders should avoid working with them completely. A simple answer to the question, is S2Trade legit? is a resounding yes. Based on all the evidence we could gather, there is nothing positive to say about the company. Fortunately, there are better options available to you that are definitely better than what S2Trade has to offer. S2Trade broker review	Overall rating:	1.2	out of 5 based on 4	reviews.